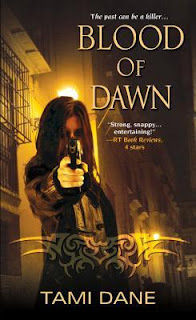 Blood of Dawn by Tami Dane is the third book featuring Sloan Skye. One thing that urban fantasy series with kickass heroines need less of is some sort of 'love interest bingo.' It's not that people don't get caught up in their romantic lives, but when it's become this predictable, something new needs to be added. Sloan is a member of the Paranormal Behavioral Analysis Unit, or PBAU, which doesn’t exactly roll off the tongue. Instead of being given a vacation, or even a break from her work, she’s given another investigation, this time undercover. The issue? Teenagers are showing up dead. Unpleasant, and something that seems to happen a lot in this sort of book. While she deals with the case, Sloan is handling the romantic advances several men, including a co-worker, as well as a former lover. To say that Sloan has more than her share of romantic entanglements is putting it mildly. As always, if readers are starting this series with the third book, they will have missed out on some of the inside jokes, character introductions, and other little things that make a series enjoyable. With that said, particularly with Sloan, having some idea of where she’s come from makes this installment more interesting, and as a standalone book, it feels a bit light. And, as somebody with only a little experience, it seems odd that Sloan would get such an important assignment. I don’t mind a little bit of romance in the urban fantasy I read, but there’s a reason why I steer clear of paranormal romance, and this book skirts the line too closely for my taste. Sloan doesn’t seem to use much in the way of ‘proper procedure’ or any actual undercover skills other than showing up, wearing some different clothes, and being the strange new girl, which could be a shoutout to 21 Jump Street if done cleverly, but it’s not. Instead, Sloan comes across as somebody who needs to take a personal holiday and sort out her romantic life before it starts interfering with her work.